Monday morning was not greeted with enthusiasm here, it rarely is tbh but today seemed more angst-ridden than usual. There were plenty of “why isn’t it still the weekend?” and that comment probably felt justified as D didn’t see me for half the weekend. There was squeaking protests, there were stomps up and down the stairs, there were emotions as every step closer to being ready for school obviously brought us closer to getting there. It was a sometimes angry/sometimes sad walk to school for D, she didn’t want to engage or hold hands. And then we were about one minute away and she told me what was wrong, finally. it was something that had happened last Monday morning in gym class and she had built it up … and up … and up until she felt able to say this morning, a week afterwards. This happens at times, sometimes it will be hours or days before D manages to say what’s bothering her and then I’ll think “of course, that explains it” and “why couldn’t you tell me before, when I’d asked if you were okay (and it was very obvious you weren’t)”. So (positivity here), I now knew what was troubling her so could mention it to her teacher before D headed off to this week’s class. It’s something that could have been sorted long before this morning and it would have saved so much worry on D’s part. Anyway, she went in happier once I’d had a very brief chat with her teacher. This afternoon was another case of emotions being built up, but from an event today. Luckily D told me more-or-less immediately (it was upsetting her) that one class member had punched another.  Not nice for D to see but – being realistic – all the pupils are in SN school for a reason and, however much they adapt and settle in, there will be times when there’s overload. We (or rather me) talked about how the child may have been feeling overwhelmed or over-anxious and maybe D would recognise times when she’s felt like that. D was getting so worried about the child who was hurt that we texted to make sure they were okay, with D smiling after having read the reply that all was well. At least we’ve got Monday out of the way. I must work out how many days for T and D it is until the end of term, they’ll enjoy counting that down and, if I make it visual for D (chart or boxes) that will really help her. 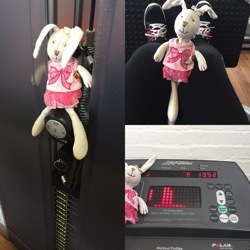 I nearly forgot, to cheer D up this morning, I said I’d take pictures of her beloved Bunny at the gym with me. Bunny worked hard!